Holders Australia powered into their fourth successive World Cup final with an emphatic seven-wicket victory over South Africa today. Australia dismissed South Africa for 149 — their lowest World Cup total — before rattling off the runs in the 32nd over. The semifinal clash proved too tough for the Kiwis yet again. They turned out to be fifth-time unlucky as they failed to cross this hurdle yet again. Despite wonderful performances in the recent past, including the thrashing of world champions and trans-Tasman rivals Australia in the Chappell-Hadlee Trophy, the Black Caps went down to mighty Lankans. The 2007 cricket World Cup signalled the end of another era when Stephen Fleming stepped down as New Zealand’s one-day captain after more than a decade at the helm.Fleming announced his decision after the 81-run defeat in the semifinal against Sri Lanka on Tuesday and said he took the step in a bid to provide “fresh energy” to himself as a batsman. 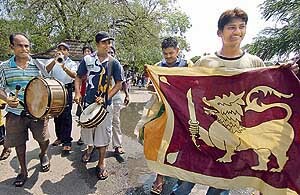 Cricket fever has gripped Sri Lanka after their team secured a place in the World Cup final, diverting attention—at least for the time being—from a worsening civil war. The BCCI’s decision to put a ceiling on players’ endorsements may have stirred a hornet’s nest but speedster S. Sreesanth insists appearing in advertisements does not affect their on-field performance. Alan Ball, the youngest member of England’s 1966 World Cup-winning side, has died of a suspected heart attack at the age of 61. Smarting from the Shanghai setback where he came tantalisingly close to scoring a point, Indian race ace Narain Karthikeyan is determined to put up a superlative show at the Brands Hatch track in the A1 GP Grand Finale this weekend. Holders Australia powered into their fourth successive World Cup final with an emphatic seven-wicket victory over South Africa today. Australia dismissed South Africa for 149 — their lowest World Cup total — before rattling off the runs in the 32nd over. The champions, chasing an unprecedented hat-trick of Cup titles, will face Sri Lanka in the final on Saturday in Bridgetown, Barbados. South Africa tumbled to their lowest total in a World Cup match when they were dismissed for 149 from 43.5 overs. South Africa’s previous lowest total was 184 in their upset loss to Bangladesh in the Super Eights. Justin Kemp top-scored with an unbeaten 49 from 91 balls while Herschelle Gibbs, who looked fortunate to survive an appeal for caught behind after scoring four, reached 39. The remainder of the batting succumbed meekly to a combination of excellent pace bowling and culpably loose shots with Shaun Tait taking four for 39 and Glenn McGrath three for 18 to regain his place at the top of the tournament’s wicket-taking list. Captain Graeme Smith was first to go, bowled by Nathan Bracken after an ugly heave across the line intended to sail over the covers. The delivery from left-hander to left-hander moved away in the air to clip the off-stump. South Africa’s senior batsman Jacques Kallis made room to drive McGrath but was bowled next ball for five trying to cut a delivery far too full for the shot. Ponting introduced Shaun Tait in the ninth over and AB de Villiers greeted the fast bowler by pulling the first ball fiercely for four. Tait immediately worked up a high pace and with his fifth ball de Villiers was beaten for speed and caught behind by Adam Gilchrist for 15. Ashwell Prince followed in the next over to McGrath, also caught behind, for a duck and Mark Boucher was out next ball. In combination with Kemp Gibbs restored some order to the innings with Kemp hooking Shane Watson fiercely for six to bring up the 50 partnership. FoW: 1-7, 2-12, 3-26, 4-27, 5-27, 6-87, 7-93, 8-103, 9-130. Bowling: Bracken 7-2-15-1, McGrath 8-1-18-3, Tait 10-0-39-4, Watson 8.5-0-49-1, Hogg 10-2-24-1. After failing to realise the dream of taking his country to their maiden final in this high-profile tournament, Kiwi skipper Stephen Fleming resigned from one-day captaincy after more than a decade at the helm, thus bringing to an end a run of 218 games in charge. New Zealand’s romance with the semis started in the maiden tournament in 1975 but the West Indies halted their march to the top at the Oval. Glenn Turner, the Kiwi skipper, was at his best during this tournament. He batted through the innings against both East Africa and India to become the only batsman with two hundreds in the tournament. But he failed against England and the West Indies in the semifinal, bringing the curtains down on the Kiwi run. In the second edition of the tournament in 1979, the Black Caps were placed second in their group (West Indies, India, Sri Lanka and New Zealand) after they lost only to the Windies. In the semifinals, they ran out of steam yet again and this time it was England who halted their journey. Though chasing 221, John Wright (69) did his best before he was run out but they fell nine runs short. In 1983 and 1987, the Kiwis failed to surpass the group stage. But they came back with a bang when they topped the nine-nation round-robin league. Martin Crowe was the leading run-scorer of the tournament and he also played the key innings of 91 in the semifinals against Pakistan. But his effort went in vain as New Zealand’s brave run came to an end as Pakistan successfully chased the target with the then unknown Inzamam-ul-Haq doing it for his country. The Black Caps, after missing out in 1996, once again reached the last four in 1999 under the able guidance of Stephen Fleming and it was a repeat semis clash of 1992. But this time Pakistan crushed them by nine wickets with Pakistan’s Saeed Anwar (113*) and Wajahatullah Wasti (84) made short work of overhauling New Zealand’s 241. 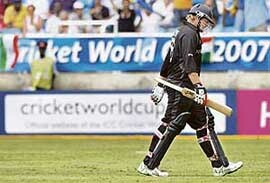 After failing to make it to the top four in 2003, Kiwis were in the semis for the fifth time. But this time it was Mahela Jayawardene-led Sri Lanka who shattered Kiwi dreams. Despite a wonderful start, the Black Caps failed to keep up the pressure and went down to a 81-run defeat, thus returning home without the coveted trophy once again. The 2007 cricket World Cup signalled the end of another era when Stephen Fleming stepped down as New Zealand’s one-day captain after more than a decade at the helm. Fleming announced his decision after the 81-run defeat in the semifinal against Sri Lanka on Tuesday and said he took the step in a bid to provide “fresh energy” to himself as a batsman. The stylish left-hander said he had arrived at his future course of action quite some time ago. “I had made up my mind long time ago though New Zealand Cricket (NZC) wasn’t privy to it as I didn’t want to hamper the preparations for the World Cup,” Fleming, who was largely acclaimed as the most cerebral of contemporary captains, said. In his over 10 years in charge of Kiwi fortunes, he led in 217 matches with a 98-106 win-loss record. Fleming did not see any conflict in New Zealand having separate captains in Tests and one-dayers as he felt with “some fine tuning and management,” it could deliver the goods. Fleming, who has played 279 one-day internationals so far, making 8037 runs at an average of 32.41 with 49 fifties and eight hundreds, reflected on his legacy saying he was someone who perhaps “added subtlety in team’s performance though it’s not as much reflected in results. “We weren’t good in key moments and even though I am proud, I am pretty disappointed that we haven’t taken the next step. The feeling is pretty hollow.” The left-hander believed that Sri Lanka, pure and simply, was a better skilled team than his own. “Sri Lanka is a more skilful team than us. They have some unusual bowlers and Australia or South Africa are good in batting. So it could be a clash of good bowling and fine batting in the finals,” he said looking ahead. Fleming did not think the toss was the major reason for his side coming unstuck in the semifinal. Cricket-mad fans sat glued to their television sets until the early hours of Wednesday morning to watch Sri Lanka defeat New Zealand in Jamaica. The success of the cricket team in the Caribbean has provided a welcome distraction from the worsening military conflict between the government and Tamil Tigers, which has left a 2002 ceasefire agreement in tatters. The two-decade civil war, which has claimed around 68,000 lives, has intensified in the past year with almost daily battles, denting business confidence and contributing to spiralling inflation. But for now, cricket was in focus. “You can feel this great sense of excitement and growing feeling of confidence that Sri Lanka really can win this tournament,” former Sri Lanka batsman and selector Sidath Wettimuny told reporters. “Victory will be a huge boost to everybody considering the country’s situation, giving all Sri Lankans a great sense of pride.” Multi-faith religious ceremonies are being planned in the lead-up to Saturday’s big game to bless the team, and President Mahinda Rajapaksa will even fly to Barbados for the final. As the excitement has built, businesses are cashing-in on the team’s success, especially bars, clubs and restaurants that have erected giant TV screens to show the matches live. “Everyone is getting behind the team and that has ensured record sales for us during the past month,” said Harpo Gooneratne, the owner of the popular Bay Leaf restaurant in central Colombo. The Excise Department has even delayed the start of an alcohol sales ban for Buddhist Wesak holidays by one day. It will now come into effect after the World Cup final. An estimated 14 million people, or 65 per cent of the island’s population, watched Sri Lanka thrash New Zealand, said a spokeswoman for state broadcaster Rupavahini, which owns exclusive terrestrial television rights for the tournament. Advertising sales have soared, with the price of a 30-second spot increasing by 150 percent, she said. Even many Tamil Tigers, who control swathes of land in the north and east of the country and are fighting for independence, are watching. “There are people in the controlled areas watching,” rebel military spokesman Rasiah Ilanthiraiyan said by telephone. But he added: “Our activities will not change because of these matches. These matches are not going to make any difference.” Sri Lanka will face Australia or South Africa in their first World Cup final since winning in 1996. Win or lose, the team will get a ticker-tape reception when they return home, with plans already underway for a public parade from the airport and a ceremony in Independence Square. Sri Lanka’s left-handed batsman Russel Arnold will retire from international cricket after the World Cup final, Sri Lanka Cricket (SLC) said today. “Russel has informed his decision to team manager Michael Tissera in Jamaica and it has now been officially conveyed to the cricket board,” SLC spokesman Samantha Algama told AFP. Arnold will, however, continue to play domestic cricket, Algama added. Arnold, 33, made his Test debut in Colombo against Pakistan in 1997 and enjoyed a permanent position in the Sri Lankan side between 1999 and 2003. Temporary loss of form forced him on the sidelines over the past two years before the selectors brought him back for the World Cup. “What’s wrong if we do it? Cricket is a religion in India, it is not like in other countries... and it (endorsements) will not affect the performance,” he said. “For example, Sachin drinks Boost (in an advertisement). If you can sell a product why not do it? Advertisements will not affect the performance for sure,” Sreesanth added. On not getting a chance to play even a single match in the World Cup, Sreesanth said, “All wishes need not necessarily materialise, but I am confident that my day will come.” He said hitting South African pacemen Andre Nel’s delivery for a six during the India-South Africa Test in Johannesburg earlier this year was the most proud moment in his career. Hampshire police confirmed today that Ball was pronounced dead in the garden of his home after apparently suffering a heart attack when trying to tackle a bonfire that had got out of control. “The fire brigade were called at 11.30 pm on Tuesday night and they discovered the body of a 61-year-old male in the garden,” a police spokesman said. There were no suspicious circumstances. “It is with the very deepest of regret that Everton Football Club has to report the death of Alan Ball,” the Premier League club said on their official Web site on Wednesday. The former Everton, Arsenal and Southampton midfielder won 72 caps for his country, scoring eight goals, before moving into management. Ball becomes the second member of the side that beat West Germany 4-2 in the 1966 final at Wembley to pass away. Captain Bobby Moore died of cancer in 1993. “I just can’t believe it. His nickname was ‘Bouncy’, he was just such a bouncy, lively 61-year-old,” England team-mate Alan Mullery told Sky Sports News. 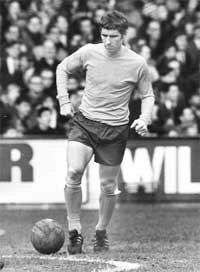 Ball started his career with Blackpool before moving to Everton in August 1966 for a British record transfer fee of £110,000. The red-haired Ball had a tenacious temperament and was part of the midfield trio, with Howard Kendall and Colin Harvey that helped Everton to the league championship in 1969-70. Eighteen months later, Ball was sold to Arsenal for £220,000. In 1973, he became only the second England player to be sent off in a full international during a vital World Cup qualifier in Poland. After 10 events in countries across the globe, Team India returns to the Brands Hatch track for the final round of the season and Karthikeyan is banking on his F3 experience at the same track for a decent finish. “I haven’t raced at the circuit since 2000, but I have good memories of the track, having won there in British F3. It’s a very difficult circuit, with some fast corners, but there are a number of places to overtake which should make for some interesting racing,” Karthikeyan said.